Every child has always dreamed off catching butterflies to view them up close. Butterflies are beautiful creatures-their colorful wings gracefully flapping as they fly gently in gardens resting at the equally beautiful flowers-they always complete the beautiful scene of a garden. No garden is really complete without these beautiful creatures hovering above the flowers. 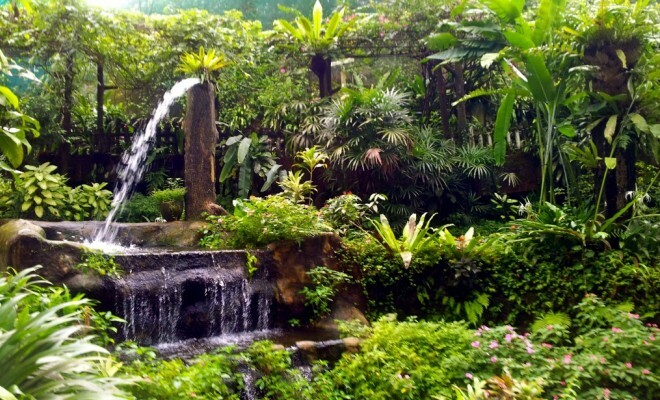 A place right in the city that has many types of butterflies to showcase, all in one place is the Kuala Lumpur Butterfly Park. The butterfly park in Kuala Lumpur has been designed to make the butterflies that fly around freely at home as much as possible. The nets that are very high above the entire park function to make sure that the butterflies don’t fly away. But don’t worry, you won’t even notice the nets that keep the butterflies in the park. The scenery here is a beautiful tropical rainforest with lush greenery and beautiful flowers to complement the beauty of the butterflies. Here is also the right place to learn about the life cycle of butterflies. There is a museum and nursery right here in the park and is the place to find out more about how butterflies-that were once mere caterpillars transform into the beautiful butterflies that you will see in the park. You may even be blessed enough to see them in transformation period! There are also preserved butterflies in the museum where you can view up close-the beauty and intricacy of the butterflies wing design and color. Live specimens can also be seen in the museum. As you walk through the limestone walkway, you will notice that there are butterflies everywhere. After all, this is a Butterfly Park. There are more than a thousand species of butterflies here and there is a big chance that you will manage to spot some rare, unique butterflies that are hard to find elsewhere. There are more than 6000 butterflies here that call the park their home. The park is opened from 9am to 6pm every day. There is an admission fee that differs for locals and foreign tourist from around the world as well as a difference in fees for an adult or a child. Photography of the butterflies in the park is allowed but you will have to pay a minor fee to bring in a camera. Getting to the park is quite simple. One way is by hailing a cab. However, cabs are quite expensive, depending on where you set out from to get to the park. A cheaper way to get to the park is by the KTM train services. This train service is quite an old one. You should alight at the Kuala Lumpur Railway station and walk towards the National Mosque. The park is located behind this within the vicinity of the Lake Gardens; another beautiful place to spend a lazy day, pick-nicking. There also are a few buses that go along the route near the bird park. Do check with the different bus companies that are on service.